Paper masks are huge business over in Asia and have been for many many years, it's quite a normal thing for teenagers over there to start using them at secondary school and it naturally becomes a weekly thing you do. I have been using these types of masks since I was around 13! A lot of people in the UK seem quite freaked out by them...the thought of putting a sheet mask over your face with cut out holes for your eyes. 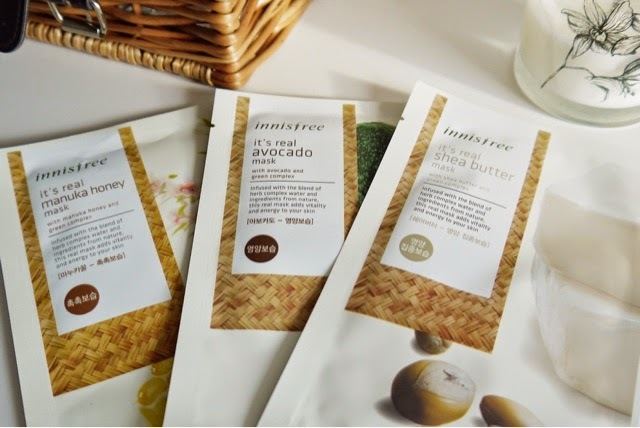 Since it is catching on over here I thought I would introduce you to one of my favourite affordable Korean brands Innisfree. 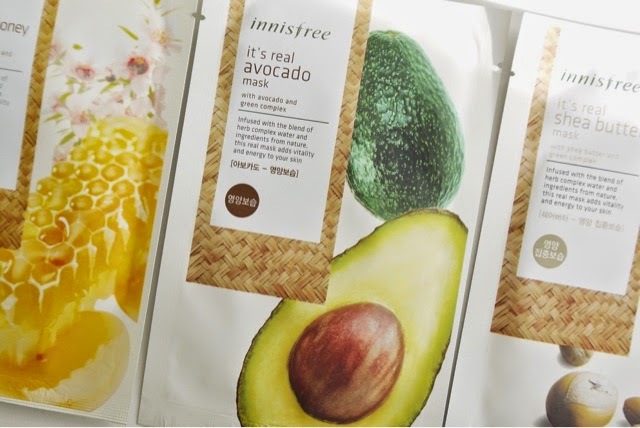 They offer a huge range of masks from broccoli through to Manuka honey. My skin is very dry / dehydrated so having tried a lot of the different ones available Avocado and Shea Butter works the best on me. Before I went away on holiday I was apply this mask daily and within the 3rd day I felt a difference in my skin already. You can tell if its working or not when you apply foundation...the product just glides on without any effort and I had no dry patched at all. Price wise they do vary online so best to do a google search "innisfree sheet mask" and see what pops up but they vary between 80p - £1.10 a sheet obviously the more you buy the cheaper they cost. They are so easy to use, after cleansing apply toner and put the mask over your face and leave for 15-20 minutes. When time is up take the mask off and rub the remaining essence over your face and that's it! Have any of you tried these types of masks before and would you be interested? If there is a lot of interest I may run a Christmas give away for you to win a selection of masks! These masks are looking great ! I love the packaging too, looks super healthy ! I'd love to try the avocado one ! Yeah didnt think about that...there is certainly a healthy look about them but most asian packaging is pleasing to the eye! I love facemasks too! They're amazing. I do them at least twice a week. I use the "my beauty diary" ones and they're amazing! I've been branching out to Korean ones though :) thanks for the review! I use to use the beauty diary ones but they are not moisturising for me! Yes give innisfree a try! Ahhh I may run a giveaway if this post turns out to be popular with everyone! That's very true! Thanks for stopping by! Oh this range is amazing, discovered it on my last trip to HK. Byebye beauty diary masks!